It’s Breeders’ Cup Week – Let’s Have Some Fun! Breeders’ Cup week is the greatest week in horse racing. 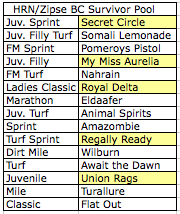 On Friday and Saturday at Churchill Downs the best horses are running in the best races with the best jockeys. The Breeders’ Cup produces some of the biggest parimutuel payouts and the wagering menu offers something for everybody. There are 10¢ superfectas, 50¢ trifectas, and 50¢ Pick 4’s and Pick 5’s. These low minimums give all of us a chance to go after the big money. Aside from handicapping and developing my betting strategy for the weekend I am involved in a few really fun activities. You can join in some of them or just follow AndyScoggin in the others. •Here is my latest Point/Counterpoint on HorseRacingNation.com/PointCounterpoint. 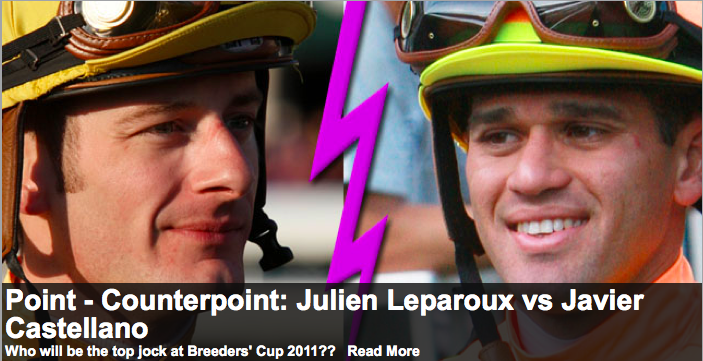 This third debate with HRN Managing Editor, Brian Zipse addresses the question, “Which jockey will win the most races in Breeders’ Cup 2011?” I chose Julien Leparoux and Brian selected Javier Castellano. Picking who will be the leading rider in the 2011 Breeders’ Cup is a daunting task. Keep in mind that Pat Day is the leading money winner in Breeders’ Cup history with over $23,000,000 in earnings but he won with only .10 of his mounts. Jerry Bailey won 15 Breeders’ Cup races, the most ever, and he was victorious at only a .15 rate. Mike Smith has the best winning percentage and that is .18. Winners are very hard to come by in the Breeders’ Cup. Click on the link above to read the whole debate. 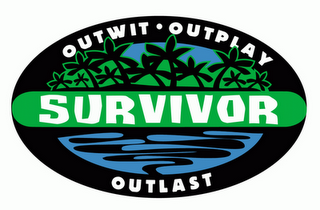 •Join in the Breeders’ Cup Survivor pool at www.horseracingnation.com through Brian Zipse’s blog. By the way, AndyScoggin is the defending champion. I will post my entry on Friday. •The final three days of the Monmouth meeting for the Place Pick 6.